Beautiful autumn makeup and a gorgeous GIVEAWAY! I’m always so inspired by first autumn days and the great light that they bring. For me it’s a little bit like spring, a new start and the feeling to create something new! After reentering from vacations, our skin is beautiful, maybe still touched by the sun. With all this divine beauty the everyday makeup should be enhanced with soft autumn inspired earth tonalities that suit every skin. I have found inspiration from the Pucci runway where they presented a beautiful natural look for fall. Emilio Pucci is especially close to my heart because I worked as a make-up artist for them when I lived in Milano. It was a great experience! I loved being around the 70’s inspired Pucci signature prints and all that glamourous dresses! I also loved the fact that they wanted me to create a nice and natural look for the models, in the same mood like this one on the pictures today. When the dress is so rich in print and hand-crafted glamour the best way is to wear a delicate make-up and a simple hairstyle. 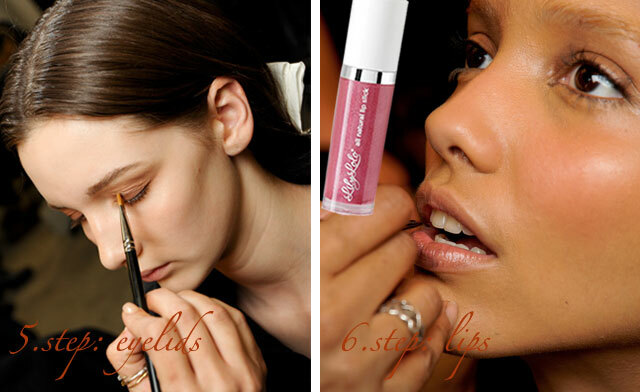 Let me show you how to achieve this quick but beautiful make-up step by step. What is more, you will also have the opportunity to recreate it at home because I’m offering again a FANTASTIC GIVEAWAY with amazing green products! Prepare your skin with a good organic moisturizer and follow with a light layer of your favorite foundation. It can be liquid foundation or mineral powder. The best option is to use just a tinted moisturizer, especially if your skin is perfect. Apply a few generous coats of mascara on previously curled eyelashes. Groom your eyebrows and if needed fill them with an eyebrow pencil. With the Lily Lolo mini kabuki brush sweep a soft layer of Lavera blush in Shimmering apricot on your cheeks and eyelids. Your face will look fresh and slightly sculpted. 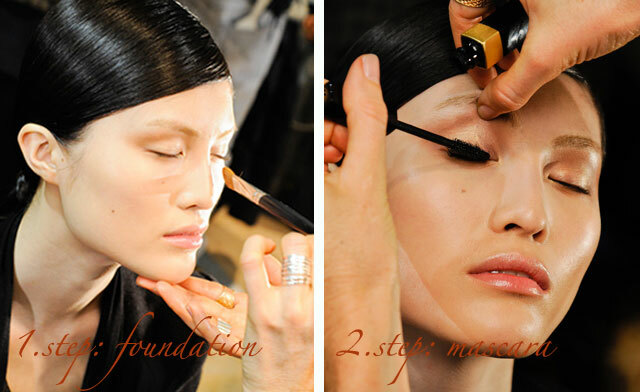 You can also use an eyeshadow brush for a precise application. Enhance your lips with Lily Lolo lip gloss in English rose – a beautiful neutral rose shade suitable for everyone. That’s all! So quick, easy and perfect for autumn days! GIVEAWAY – autumn makeup trends! You will not just have to opportunity to enrich your make-up kit and recreate this look, but you will also receive an aromatherapeutic balm for uplifting your mood when you need to rebalance your soul! 1. Lavera blush in Shimmering apricot – a gorgeous shade suitable for almost every skin type. 2. Lily Lolo lip gloss in English rose shade (a neutral rose) and an enticing aroma! 3. Lily Lolo mini kabuki brush – great for applying blush and face powder products, fantastic on-the-go! 4. Badger Balm Stress Soother – organic Tangerine&Rosemary balm to apply on temples and hands to feel relaxed! A must-have item for traveling! Calm, Cool, Relaxed Awareness are the keywords of this portable organic aromatherapy gem! 1. Comment below (just on the blog): Drop a few thoughts about this make-up look or giveaway products. For those who already follow Green makeup blog and social media, follow just the step 1 (comment below). The giveaway is open internationally and finishes on Monday, September 3rd, 2012, at 24:00 CEST. I will announce the random chosen winner the day after on my blog, Facebook page and Twitter! This giveaway was generously sponsored by one of my favorite green shops Ecco-verde. (Note that you can order from Slovenia, Italy, Germany and Austria). Currently, you can find over 1,800 natural cosmetics products from international vendors on Ecco Verde, and we are constantly adding more! From hand cremes, shampoos and body care products to a wide range of especially skin-friendly mineral makeup, there is something that your heart desires on Ecco Verde! Natural cosmetics are not inferior to chemical, synthetic cosmetic products. Quite on the contrary! With natural cosmetics you don’t only do something good for your body, but also for the environment! Our products are free of harmful, chemical cocktails and consist of high-quality organic oils and raw plant materials, which for the most part come from controlled organic farming. 0 comment on Beautiful autumn makeup and a gorgeous GIVEAWAY! Very pretty look! What do you recommend for a natural mascara that doesn’t run or flake? I always end up looking like a raccoon! 1) I love autumnal looks- if I could pick just one type of makeup look, I’d stick with that one. The Lavera blush in apricot is gorgeous! I’m gushing, because I have a hard time finding a blush that is good for my light-medium, warm skin tone. Also, I’m kind of in love with Badger balms. I haven’t tried the stress soother, but I think I’ll need it for when I get to grad school! 😀 Thanks for having such a lovely giveaway. This look looks beautiful and soft Dasha! It makes me think of the soft sunlight in autumn that shines on the colored leaves.. The autumn is my favor season, it is so nice to know that cosmetics products to giveaway. A very beautiful and natural look that can be an everyday makeup look for me. Thank you for the giveaway! Hot summer day will go away soon, fall is my favor season. So happy to see beautiful autumn make up here. They are gorgeous. Thank you so much for the lovely giveaway! The makeup is so beautiful! Very fresh and lovely and rosy for autumn. may I be as beautiful as the model in the first pic? Maybe not, but the make-up you and Ecco-Verde are giving away would be really helpful! 😉 Joking aside, the most important thing of green make up is enhancing one’s natural beauty and this encourages an inner process. A couple of questions: if the liquid foundation is moisturizing by itself, can we skip the first step with the moisturizer? What do you think about thermic lash curlers? -Yes you can absolutely skip the moisturizer, otherwise you have too much layers. You want the make-up to look natural and flawless, while enhancing your skin. -I’m not a fan of thermic lash curlers. I have tried some of them, but I prefer the usual curler. I love the Japonesque curlers, they come in various shapes. Regarding thermic curlers I have the same thoughts as for the hair curlers. When you treat your hair everyday with temperature that is not normal, you will just end up with damaged hair. I have seen these too many times and even good hairdressers know that is not ok for your hair(in our case lashes) to use such a high heat everyday. Love the colors. Not tipicaly autumn colors – but looks beautifuly. The makeup is awesome, just like autumn.I love the fact that you have shown different types of girls, it is very useful (and pretty) see different ethnycities. I’m specially excited about this giveaway, as I love Ecco-verde but it doesn’t sell to my country, so this is a great opportunity! Lily Lolo and Badger Balm are fantastic and I haven’t tried the products you offer. I haven’t tried Lavera at all, but I really adore peachy colours, so it sounds fun! Thanks! The blush looks lovely! I, too, love the may makeup trends mature for autumn. I love the soft make up…just enough to make a great look change. I love natural looks, so this is right up my alley. I have also been looking for a shade of blush that works with my skin… I have light skin with pretty strong yellow undertones, so everything seems to be too obvious on me (which I hate). I will definitely look into this Lavera blush… I like quite a few of the makeup items they do. I’ve also seen Lily Lolo mentioned in quite a few places but have not had a chance to try their products. Maybe I’ll be lucky this time! I like this look! It’s so fresh and natural looking. Very pretty. I particularly love the lip gloss! I follow your blog via WordPress. I love how natural and easy these looks are! 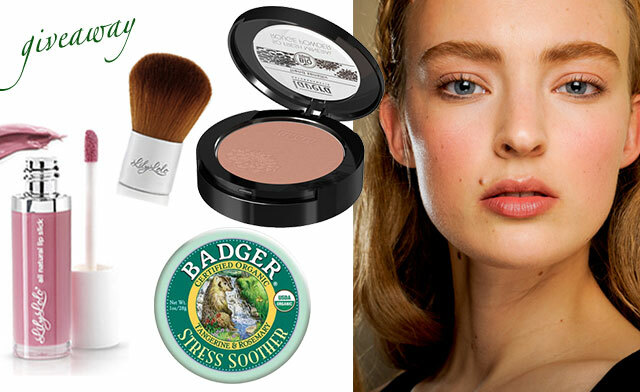 I have quite pale skin so this blusher would be great to create a really rosy, autumn look. I’ve heard of both Lily Lolo and Badger before but I haven’t tried any of the products above and I would love to! I a huge fan of natural products too so this would be great to win! The looks are about glowy skin and natural makeup. I didn’t know pink can be so flattering on neutral skin tone. Awesome products! Absolutely stunning! I could relate.This is the kind of make-up look I always try to achieve because I prefer my bold coloured outfits to stand out more than my make-up, especially on a normal day. Would use these products everyday without a doubt! thank you for the opportunity. I only discovered your blog a few weeks ago and I really love it!!! I´m using natural products since I was 12 – so I really grew up with it. Still love the brands that I discovered then, Weleda, Lavera and Dr.Hauschka. I love this fresh look – would really be happy to recreate it with such beautiful products. I follow your blog + will like it on twitter and facebook (@EmmaWessels). I’m looking forward to fall makeup, too! 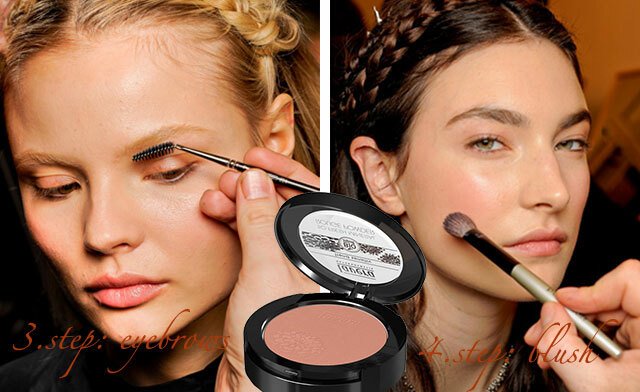 I prefer nuetral looks, and the fall is the perfect time to deepen those calors to a more earthy, no makeup look. I follow you and liked your FB! amazing givewaway.. and i absolutely the rosy cheeks by ur blush its superbbb..
What you write about the fall is soo true! the light is my favorite light of the year and the skin often still has a bit of a summer glow in it. Although i also have to say that my skin in the fall also has a hard time adapting to the changing conditions. therefore I often use cream products. Especially the lavera blush (although not creamy) sounds perfect for the fall, not too bright, not too orange not to bronzer-ish… just fresh and natural. Btw I follow your blog regularly and love the combination of great writing (and not tooo long ;)) and your experience from your work! Way too go!!!! 1) Wow, that blush and gloss are so gorgeous! Autumn is my favorite season for playing with makeup! the look is so natural and the blush is so nice and sheer. Hello to all of you and THANK YOU for joining my second giveaway! I was so happy to read all your comments! Today it’s also time to announce the winner! The randomizer program has chosen the n.4 and the winner is: Charlotte! Congratulations! You will be contacted via email to let me know your address, where I can send the gift. Wish good luck to all other readers in my future giveaways! All the prizes looks wonderful! Specially the gloss, I love gloss! I liked on facebook and I’m already a email subscriber.